VANCOUVER, BC--(Marketwired - June 07, 2016) - INDOCHINO, the world's largest made to measure men's apparel company, has achieved outstanding year-to-date growth of 67% and announced May as its biggest sales month ever. To continue the growth trajectory, the company initiated its retail expansion plans in June by opening a showroom in Mississauga's Square One. "We set out to see if we could surpass the incredible Black Friday sales we achieved in November 2015, in May 2016, and we did it," said INDOCHINO's Chief Executive Officer, Drew Green. "We achieved these results without the addition of new stores or any major e-commerce enhancements, both of which are investments that we will announce throughout the second half of 2016. As an early indication of what retail expansion can do to our growth, omnichannel sales are up an incredible 171% year over year in the first week of June." Drew Green continued: "We are over 10% ahead of plan year to date across our showrooms, and are well on our way to achieving our 2016 100% year over year growth plan, which will be powered by our commitment to showroom expansion, especially given the impact our showrooms have on our online sales." 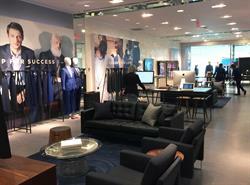 INDOCHINO opened its eighth showroom in Mississauga's Square One Shopping Centre on June 1. Square One is the first of several locations planned for 2016 and INDOCHINO's second showroom in the Greater Toronto Area. "The team's hard work, focus and collaborative approach to daily efforts is paying off. We're one of the fastest growing apparel brands in the world and, given our plans for expansion, the best is yet to come," said INDOCHINO's Chief Executive Officer, Drew Green. "With retail sales representing 46% of the business approximately 21 months after we first entered the category in 2014, our continued retail expansion will play a crucial role in fuelling our exponential growth, both online and overall." Earlier this year, Square One opened its highly anticipated luxury wing. INDOCHINO joins aspirational fashion retailers, including Holt Renfrew, Harry Rosen, Kate Spade New York, and Ben Sherman. Located in a 2,900 square foot space in Square One Shopping Centre, the showroom is set to redefine the way men in the city shop by enabling them to get perfectly fitting, personalized clothing made just for them. The showroom promises an exclusive shopping experience without the high price tag. Customers are paired with a Style Guide who helps them to design their own one-of-a-kind suit or shirt. Style Guides take measurements, assist with fabric selection, and walk shoppers through endless custom options, including buttons, vents, pockets, lapels and monograms. Each garment is made to order and delivered within four weeks. Customers can walk in or schedule an appointment at: www.indochino.com/showrooms. In March 2016, INDOCHINO received a strategic investment by Dayang Group, a global apparel manufacturer to help accelerate the company's expansion plans, significantly enhance the product offering to its customers, and generate additional operating efficiencies. In the first five months of 2016, INDOCHINO has expanded its suit offering from 129 to 250 suit fabrics and similarly has increased its shirt fabric's from 78 to 200. "We won't rest until we have the most unique, best and broadest assortment of made to measure suit and shirt fabrics, giving our customers more choice and selection, to get their look their way," said Tom Kearnan, Director of Apparel Development and Merchandising. "We have combed the markets of the world to bring current and timeless fashion to our customers, at a price that provides the best value available on the North American market." Founded in 2007, Vancouver-based apparel brand INDOCHINO is at the forefront of revolutionizing men's fashion. By combining luxury fabrics, perfect fit and customized style INDOCHINO creates one-of-a-kind suits. Since its inception, INDOCHINO has grown from the first online business to provide custom tailored suits into the largest made-to-measure menswear brand in the market. Through a seamless multi-channel approach to the customer experience, men are easily able to order high-quality, attainably priced made-to-measure suits and shirts plus accessories online, via mobile devices, or in-person at INDOCHINO's showrooms in New York, Beverly Hills, San Francisco, Boston, Philadelphia, Toronto and Vancouver.